Greetings, specpo people! 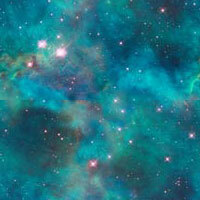 It’s April, which makes it National Poetry Month in the US and actually in many star systems in the quadrant. This year marks the 15th anniversary of the HAY(NA)KU, a poetic form invented by Filipino American poet Eileen R. Tabios: a tercet with one word in the first line, two in the second, and three in the third. Eileen wanted to call it the Philippine Haiku, but I suggested “hay(na)ku,” a pun on the Filipino expression hay naku—untranslatable directly but meaning something on the order of oh my gosh in surprise or exasperation—and haiku, with na (meaning “already” in Filipino) splitting the hay and ku. Variants of the hay(na)ku include the reverse hay(na)ku (3-2-1), chained hay(na)ku (longer poems constructed of hay(na)ku stanzas), and my own invention, the hay(na)ku sonnet (5 hay(na)ku stanzas with the last compressed into a couplet of 3 words per line in order to total 14 lines). Apropos for us here on Planet Star*Line is the SF hay(na)ku called a sci(na)ku. You’ll find several sci(na)ku as well as fantasy and horror hay(na)ku in this issue by Kathleen A. Lawrence, Katrina Archer, Lauren McBride (even one co-authored with her son Jacob McBride), and Roxanne Barbour. In fact, Roxanne has just invented a new variant, the hay(na)ku tanka, with 5 lines of 1 word, 2 words, 3, 2, then 1. Of course—because specpo—she gives us sci(na)ku tanka, two examples of which are below; the poem on the right is even a reverse one! (5 lines of 3 words, 2 words, then 1, 2, 3.) I hope you enjoy these sci(na)ku / hay(na)ku poems. The poems here also include a list poem by Arjun Rajendran, a fib and cheritas by David C. Kopaska-Merkel, a ghazal by Joshua Gage, and another rondeau redoublé by Mindy Watson. Eileen R. Tabios is also here with a robot tanka. 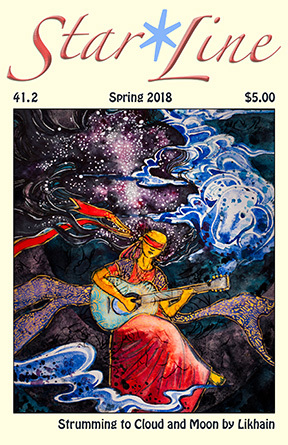 We’re happy to honor Asian American Heritage Month (May in the US) with cover art by Likhain, continuing Star*Line’s 40th SFPA anniversary celebration with art by poets. She gives us a genderbending re-vision of Heinlein’s blind poet Rhysling and a space dog for the Chinese Year of the Dog. Now go write some sci(na)ku!